Pro Data Doctor introducing advanced iPod Files Recovery Software designed to recover lost or deleted files and folders from Apple iPod media player. iPod file retrieval tool retrieves accidentally deleted or lost data including mp3, mp4 music, pictures, photos, audio, video files and folders from iPod media player. 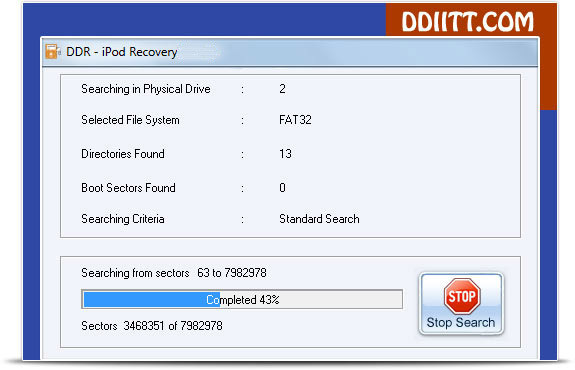 iPod data recovery application not only retrieves deleted data but also save recovered files at safe location. Apple iPod real time player undelete software is compatible with all major iPod models including iPod Classic, iPod Mini, iPod Nano, iPod Shuffle in all first to next generation series. Retrieves lost mp3, mp4, music files, audio-video files and folders from iPod media player. Safely recover lost files due to virus infected drive, software malfunctioning and improper handling of portable multimedia player. Retrieve files or directories from all iPod models like iPod Mini, iPod Classic, iPod Touch, iPod Nano in all first to next generation series. Provides data restoration even if data reset operation is performed on your multimedia player. Supports major audio, video and picture file formats including mp3, aac, m4a, aiff, wav, mpeg4, QuickTime, jpeg, bmp, png, tiff and many more. Provides attractive and interactive GUI interface and easy to use for beginner and novice users.